If the trend is good enough, then why don't you wear it all year round? In today's post I want you to have a look through the best ways on how to wear plaid and tartan shirts this Fall season. There is an option for any lady, no matter what is your favorite style. You can pair these pretty buffalo checks, plaids, tartans and flannel with anything you want, starting from boyfriends jeans and sweaters to skinnies, down vests and leather jackets. Speaking of possible places to appear in these bright print tops, then I can mention casual coffee cafe bars to office hours. In this article you are going to see fantastic Polyvore sets inspiring by various ways of wearing tartan shirts. Tell me your thoughts in the comments below. 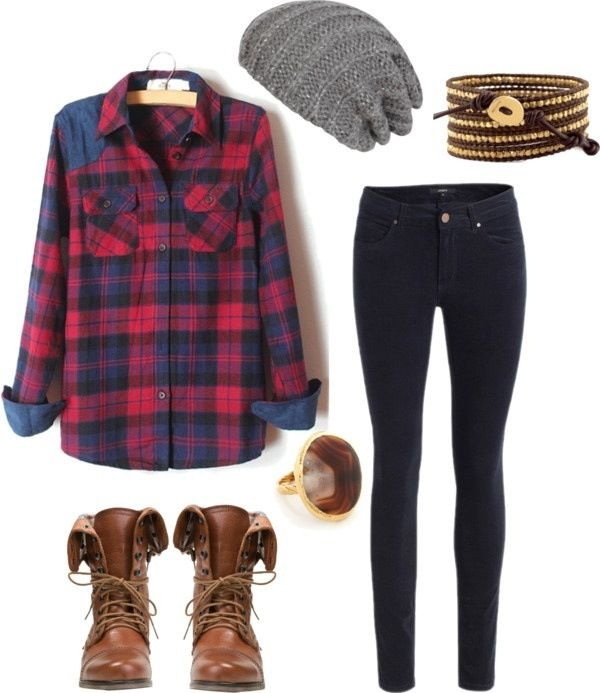 Keep it simple and try on tartan with black skinnies, cable knit grey beanie and brown leather lace-up boots. Red tartan is on its way! If you want to try something awesome, bright and trendy, then I am here to share with you these gorgeous red tartan shirts and possible ways how to wear them in your everyday lives. These cool cover-ups are ideal for spring and summer months wear. You are going to be amazed by the variety of fashionable ways to wear your red tartan shirts this warm season. You can keep it semi formal by wearing a cool black blazer with tartan shirt tucked in light beige slim-fit jeans. Finish the look by adding black leather satchel bag and Clubmaster sunglasses.